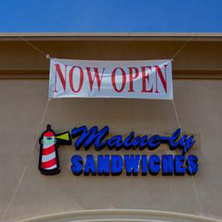 Welcome to Maine-ly Sandwiches. We are your local Houston sandwich shop. We offer a variety of sandwich choices: Turkey, smoked ham, tuna salad, veggie, Italian, BLT, spicy salami, roast beef, grilled chicken, cheeseburger, meatball, chicken salad. We also have specialty sandwiches, including the crab roll, and our most popular choice, the lobster roll. 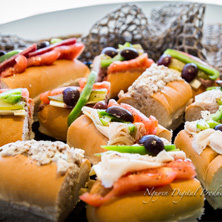 All of our sandwiches can be customized with the toppings of your choice to compliment the flavors. We even offer fried clams and fried clam rolls! Compliment your sandwich with a serving of our homemade mac n’ cheese, coleslaw, fries, or a bread bowl filled with one of our soup specials. Additionally, we offer salads for those of you counting carbs. Stop by during your lunch hour for one of our combo meals, or bring the whole family in for an affordable and delicious dinner outing! While Maine-ly Sandwiches is famous for their delightful lobster and crab rolls, they also offer a one of a kind dessert that is hard to come by: The whoopie pie. We are known for these fresh homemade, soft, chocolate cookies sandwiching a dolop of marshmallow creme. Try the original whoopie pie in chocolate or surprise your tastebuds with one of our specialty whoopie pies: Blueberry, snickerdoodle, nutella, very strawberry, girl scout thin mint, chocolate chip cookie dough, red velvet, chocolate chip cookie, pumpkin, ginger nog, rocky road, peanut butter, s’mores, or cookies and cream. Stop in to fill your whoopie pie craving or order online. Buy individually or by the dozen! 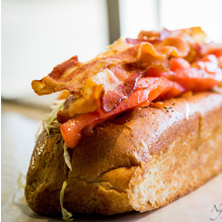 For all of your whoopie pie and lobster roll cravings, head to Maine-ly Sandwiches!